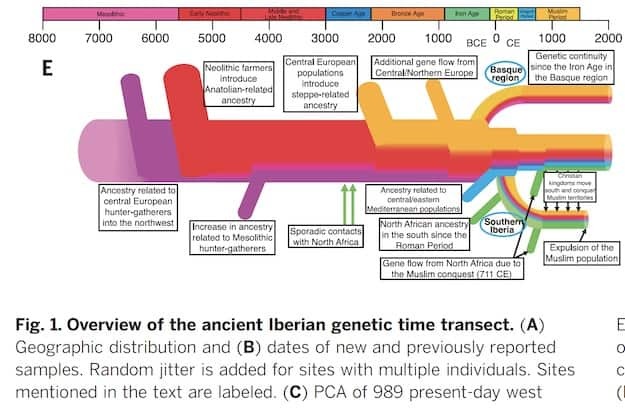 The figure above is from The genomic history of the Iberian Peninsula over the past 8000 years. If you had seen something like this five years ago, you’d be gobsmacked. But today this is not atypical, especially in light of the fact that Spain seems to harbor many good sites in relation to the preservation of ancient DNA. In the figure above you see an excellent representation of the different streams of ancestry and settlement within Spain over the last 8,000 years. You can conclude from it, for example, that only a small proportion of the ancestry of modern Spaniards derives from people who were residents of the peninsula during the Pleistocene. Similarly, you can also conclude that a minority, though non-trivial, proportion of the ancestry of modern-day Spaniards derives from people who arrived during Classical Antiquity and the Moorish period. And, confirming earlier work, the Basques seem to be relatively untouched by these later gene flow events. To some extent, we all knew that, as the Basques were famously exempt from limpieza de sangre, the blood purity laws of medieval Spain. But importantly, the Basques have a substantial amount of ancestry from peoples whose heritage goes back to Central Europe, and to a great extent, the forest-steppe of far eastern Europe. This is a huge change from what was understood fifteen years ago. As the Basques speak a clearly non-Indo-European language, many scholars hypothesized that they were remnants of hunter-gatherer peoples, who had been resident in the Iberian peninsula since the Pleistocene. But the reality is that the origin of the Basques is likely in the arrival of Near Eastern farmers. The Basques share a strong genetic affinity with the peoples of Sardinia, who are the closest proxies in modern European populations for this group. Importantly, the Basque difference from Sardinians is their much greater proportion of Central European/steppe-like ancestry. How did they get this ancestry? One of the major results of this paper is that a particular branch of R1b came to dominate Spain around 4,000 years ago. Before this period the dominant Y chromosomal lineages in the Iberian peninsula were those associated with the farmer populations. The frequency of R1b is above 80% in Basque males. This is one reason that earlier scholarship assumed that R1b was associated with European hunter-gatherers (the Basque being the descendants of those people). Today, we know that both branches of R1 seem to have expanded ~4,000 years ago and that the most common lineages in western and southern Eurasia seem to go back to the steppe peoples. It may be that the Basque language actually derives from the steppe as non-Indo-European peoples expanded along with the Indo-Europeans, adopting similar cultural habits and characteristics. This is not a crazy position. The Magyars, for example, are not Turkic or Indo-European, but they adopted a lifestyle associated earlier and simultaneously with Turkic and Indo-European pastoralists. But let’s set this possibility aside. Another option is that the Basque descend from one of the post-Cardial cultures of southwest Europe. That is, their language has roots in the dialects of the early Anatolian farmers. Unlike other peoples, they absorbed the influx of Indo-Europeans, and culturally assimilated them. This too is not crazy. But how might they have absorbed the Indo-Europeans? In the paper above they tentatively argue, from some of their results, that the Indo-European influx was more male than female. There are suggestions that Basque society may have had matrilineal aspects. This does not entail that they were “matriarchal,” but rather, that inheritance passed through the maternal line. Matrilineal societies are not necessary pacific. The Iroquois are a case in point. And, they have a natural way of assimilating warbands of alien males: these men could become integrated into the preexistent kinship networks. How might the rise of R1b lineages have occurred so fast? One could posit those young men with Indo-European fathers may have had connections to hostile Indo-European tribes that their cousins with non-Indo-European fathers lacked. If the Indo-Europeans were patrilineal, as seems likely, and the proto-Basques were matrilineal, then these men would have been well placed to better protect the cultural integrity and political independence of their maternal heritage through connections of their paternal lineage. I have an explicit model here: the intermarriage of European trappers in the American West with native women. In many cases, the children of these men would be raised within a native context, and so served as a bridge of sorts. And, there is another analogy: the frequency of R1a is quite high in some non-Indo-European groups in South Asia. It will turn out, I believe, that Southern Europe and India share many similarities, as the Indo-Europeans encountered people in these regions with rich and complex societies. Several years ago, A recent bottleneck of Y chromosome diversity coincides with a global change in culture, was published. The authors note there was an explosive growth several Y chromosomal lineages, including R1b and R1a, on the order of 4,000 years ago. Recently the evolutionary anthropologist Joe Henrich stated that “Religion is a technology for scaling up human societies.” With this in mind, I will state here that patriarchy is a technology for swallowing up human societies. The distribution of Y chromosomal lineages associated with early Indo-European extends outside of the boundaries of Indo-European languages. In fact, the expansion of I1, concordant with R1b, suggests that non-Indo-European lineages were assimilated into expanding Indo-European groups. There is, of course, a debate whether this expansion was violent or not. I suggest above a way in which Indo-European lineages, at least by origin, could become pervasive in a non-Indo-European society. But, it does seem to more plausible that more direct forms of marginalization were likely. In a pre-modern environment not far from the Malthusian limit it wouldn’t take much for certain male lineages to replace themselves, while others to die out. The descent from antiquity project in Europe is difficult because there does seem to have been an elite paternal lineage rupture with the fall of Rome. Many modern noble families are traceable to the centuries after the fall of Rome, but none of them clearly are linked to before the fall of Rome. This does not mean that there was a massacre of those lineages, but that elite lineages which lost their rents would quickly lose their status. I do think what we call war was part of the expansion. But war was likely simply one of the many manifestations of the power of rise of these bands of brothers. 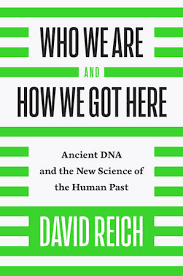 Comments Off on David Reich strikes back! 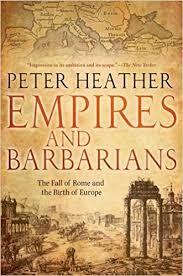 Ten years ago when I read Peter Heather’s Empires and Barbarians, its thesis that the migrations and conquests of the post-Roman period were at least in part folk wanderings, where men, women, and children swarmed into the collapsing Empire en masse, was somewhat edgy. Today Heather’s model has to a large extent been validated. The recent paper on the Lombard migration, the discovery that the Lombards were indeed by and large genetically coherent as a transplanted German tribe in Pannonia and later northern Italy, confirms the older views which Heather attempted to resurrect. Additionally, the Lombards also seem to have been defined by a dominant group of elite male lineages. Why is this even surprising? Because to a great extent, the ethnic and tribal character of the post-Roman power transfer between Late Antique elites and the newcomers was diminished and dismissed for decades. I can still remember the moment in 2010 when I was browsing books on Late Antiquity at Foyles in London and opened a page on a monograph devoted to the society of the Vandal kingdom in North Africa. The author explained that though the Vandals were defined by a particular set of cultural codes and mores, they were to a great extent an ad hoc group of mercenaries and refugees, whose ethnic identity emerged de novo on the post-Roman landscape. In the next few years, we will probably get Vandal DNA from North Africa. I predict that they will be notably German (though with admixture, especially as time progresses). Additionally, I predict most of the males will be haplogroup R1b or I1. But the Vandal kingdom was actually one where there was a secondary group of barbarians: the Alans. It was Regnum Vandalorum et Alanorum. I predict that Alan males will be R1a. In particular, R1a1a-z93. The German groups which invaded the Western Roman Empire were agropastoralists. That is, they were slash and burn farmers who raised livestock. Though they were mobile, they were not nomads of the open steppe. Man for man the Germans of Late Antiquity had more skills applicable to the military life than the Roman peasant. This explains in part their representation in the Roman armed forces in large numbers starting in the 3rd century. But the people of the steppe, pure nomads, were even more fearsome. Ask the Goths about the Huns. Whole German tribes, like the Cimbri, might coordinate for a singular migration for new territory, but for the exclusive pastoralist, their whole existence was migration. Groups such as the Goths and Vandals might settle down, and become primary producers again, but pure pastoralists probably required some natural level of predation and extortion upon settled peoples to obtain a lifestyle beyond marginal subsistence. Which is to say that some of the characterizations of Late Antique barbarians as ad hoc configurations might apply more to steppe hordes. There has been enough work on these populations over the past few years to admit that various groups have different genetic characteristics, indicative of a somewhat delimited breeding population. But, invariably there are outliers here and there, and indications of periodic reversals of migration and interactions with populations from other parts of Eurasia. I’m assuming you aren’t surprised. These steppe tribes seem to be defined by extended paternal lineage networks. The Sbruna people are R1a1a1, as is dominant in Eastern Europe today. But, an ancient Sbruna male dating to 1800 BC was found to have the Asian variant of R1a1a1, found in South and Central Asia, not the one predominant among Slavic peoples. The Bronze Age Srubnaya-Alakulskaya individuals from Kazburun 1/Muradym 8 presented genetic similarities to the previously published Srubnaya individuals. 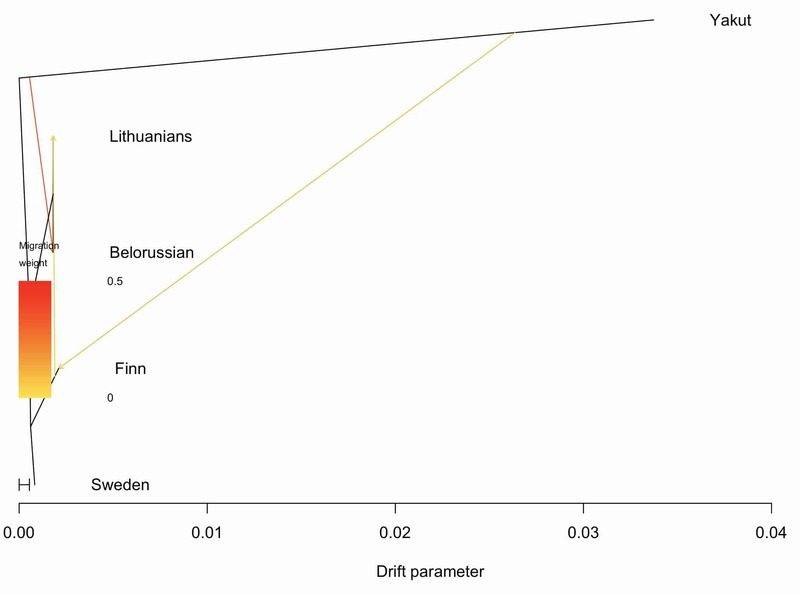 However, in f4 statistics, they shared more drift with representatives of the Andronovo and Afanasievo populations compared to the published Srubnaya individuals. Those apparently West Eurasian people lacked significant Siberian components (NEA and SEA) in ADMIXTURE analyses but carried traces of the SA component that could represent an earlier connection to ancient Bactria. The presence of an SA component (as well as finding of metals imported from Tien Shan Mountains in Muradym 8) could therefore reflect a connection to the complex networks of the nomadic transmigration patterns characteristic of seasonal steppe population movements…. A second possibility though is that the South Asian ancestry is artifactual and that it’s just emerging in ADMIXTURE because of shared ancestry between the Sbruna and South Asians because of gene flow from the steppe into South Asia (and since South Asians have “Iranian farmer” ancestry it also pops up in the Iranian Neolithich sample). Philological and linguistic evidence indicates that the bulk of the Rigveda Samhita was composed in the northwestern region of the Indian subcontinent, most likely between c. 1500 and 1200 BC. Mitannia Indo-Aryan is attested in Syria in 1380 BC. In the centuries around 1500 BC it seems quite possible that there was a “Indo-Aryan Inner Asian International”, just as in the first millennium AD there emerged a Turkic International, and for more than a century after 1200 AD there was a Mongol International. In the north, the Indo-Aryans were absorbed by Iranian and Uralic peoples. In West Asia they didn’t have a major cultural impact, aside from introducing chariots. It is in India by happenstance that Indo-Aryan linguistic culture and aspects of their folk memory is preserved to this day. This isn’t that amazing. Half of the speakers of Turkic langauges are ethnic Turks, who live in Turkey. Anatolia genetically isn’t really very East Asian, though there is some of that. But the cultural heritage of the ancient Turks remains stronger there than in areas anciently inhabited by Turks, such as western Mongolia (where the people are genetically more like the original Turks were in the first millennium AD). What’s the upshot here? I think that there is a spectrum of passivity and xenophobia in the modes of production outlined above. Sedentary peasant peoples are the most conservative and xenophobic. They are also the least warlike because their skill set is the least transferable to warfare. They specialize in production, not extortion. Pure nomads are the least xenophobic and most open to various forms of cultural innovation. The Mongol horde rapidly expanded in the decades of Genghis Khan’s rule through assimilation of various Turkic and Tungusic peoples. Though Genghis Khan put his sons by his first wife Borte in all the major positions, competent individuals outside of his own family line were elevated to power and authority. 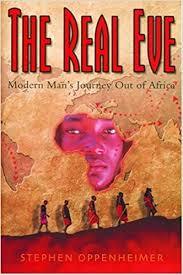 We have enough evidence now that these social dynamics are also strongly driven by the reality of migrating males, who marry a variety of conquered peoples. Though Mongols were religiously tolerant and relatively accepting of ethnic diversity so long as subordinate peoples did not rebel, they were fundamentally an extortive order where organized mass violence was always the weapon of first resort. They were almost certainly not atypical, but continuing an Inner Asian tradition which probably dates to the Bronze Age, and matured 1,000 years later with groups like the Scythians. Agropastoralists, such as the people of Nothern Europe during antiquity, were probably somewhere in between peasants and nomads. Not as xenophobic as peasants, but definitely more inward looking than the steppe nomads. Running ADMIXTURE after some outlier removal you see that the northern Han are distinct because they share ancestry from the Yakut modal cluster. In contrast, the Mongols and Uyghurs have ancestry from the Lithuanian modal cluster. Uygurs also have quite a bit of ancestry from the Druze modal cluster, which is West Asian. Also notice that the Mongol2 cluster, which shares more ancestry with the Yakuts also has more Lithuanian modal cluster ancestry. Two of the Mongol2 individuals are labeled as Khalkha. 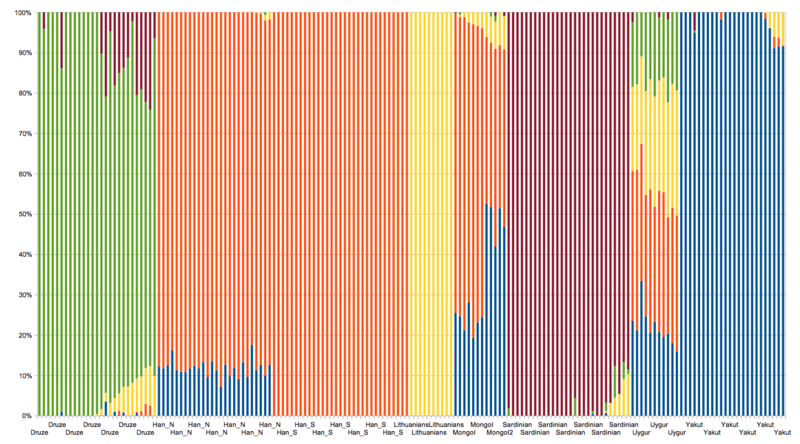 Using some of the Sarmatian/Scythian samples from David Reich’s lab, I ran ADMIXTURE again. These ancient samples need to be interpreted with caution, as usual. 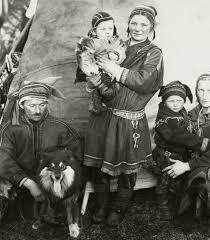 But notice again that the northern Han obtain their minor ancestry from the Yakut. The Iron Age nomadic modal ancestry is found at low levels in the Mongols and Uygurs. I think this is a real effect. The presence of Alans with the hordes of the Mongol Empire is well attested, though the admixture is almost certainly earlier. 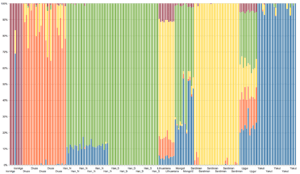 I ran some three population tests. This is what was notable. I literally spend an hour on this assembling the data. But I think the easiest conclusion to draw is that the “West Eurasian” shift in modern Chinese (north) is probably mediated through Turkic people. Comments Off on Do the northern Chinese have Scythian ancestors? 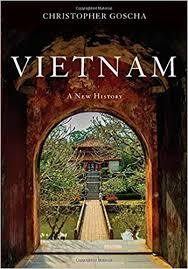 A comment below suggested another book on Vietnamese history, which I am endeavoring to read in the near future. The comment also brought up issues relating to the ethnogenesis of the Vietnamese people, their relationship to the Yue (or lack thereof) and the Khmer, and also the Han Chinese. Obviously, I can’t speak to the details of linguistics and area studies history. But I can say a bit about genetics because over the years I’ve assembled a reasonable data set of Asians, both public and private. The 1000 Genomes collected Vietnamese from Ho Chi Minh City in the south. I compared them to a variety of populations using ADMIXTURE with 5 populations. You can click to enlarge, but I can tell you that the Vietnamese samples vary less than the Cambodian ones, and resemble Dai more than the other populations. The Dai were sampled from southern Yunnan, in China, and historically were much more common in southern China, before their assimilation into the Han (as well as the migration of others to Southeast Asia). Curiously, I have four non-Chinese samples from Thailand, and they look to be more like the Cambodians. This aligns well with historical and other genetic evidence the Thai identity emerged from the assimilation of Tai migrants into the Austro-Asiatic (Mon and Khmer) substrate. Aside from a few Vietnamese who seem Chinese, or a few who are likely Khmer or of related peoples, the Vietnamese do seem to have some Khmer ancestry. Or something like that. Narrowing the populations, and using Indians as an outgroup, I wanted to test the Vietnamese against a few select populations. 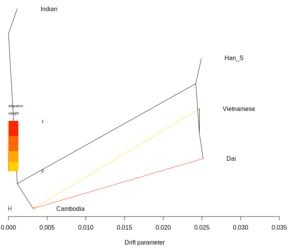 In the graph to the right you see that they are on the same branch as the Dai, and there is gene flow from the Dia into the Cambodians, and from the Cambodians into the Vietnamese. These results actually suggest that the Cambodians have had more gene flow in than the Vietnamese. If you check the ADMIXTURE plot though you notice that there is a huge range of variation in the Cambodians in terms of their ancestry. The Mon kingdoms to the west of Cambodia fell to the Tai, but Cambodia itself did not. It probably absorbed a fair amount of Tai ancestry though, even if it retained its cultural distinctiveness and character. 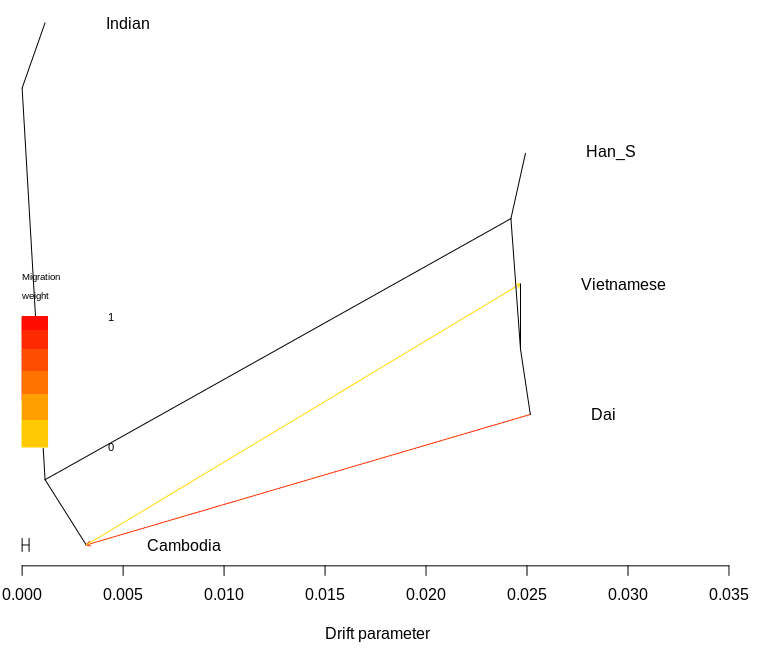 A PCA shows that the Vietnamese are a distinct cluster. Different from both the Dai and South Chinese. Some of the samples in the 1000 Genomes are shifted toward the Cambodians and others toward the Chinese. That sound you hear is the rumbling of the earth caused by the rippling tsunami that’s coming. The swell of ancient DNA papers focused on historical, rather than prehistorical, time periods. Some historians are cheering. Some are fearful. Others know not what to think. It will be. The illiterate barbarians of yore shall come out of the shadows. If they had arrived on the edge of Europe two centuries earlier, the Avars would have a reputation as fearsome with the Huns, with whom they are often confused, and rightly so. 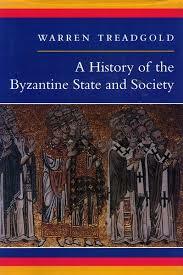 But the Avars emerged as a force on the European landscape after the end of the West Roman Empire. The post-Roman polities did not have their own Ammianus Marcellinus (sorry Bede, you lived in the middle of nowhere). And yet for centuries the Avars dominated east-central Europe and held the numerous Slavic tribes in thrall. They smashed past the borders of Byzantium during the reign of the heir of Justinian, and by 600 AD, on the eve of the great battle with Persia Constantinople had lost control of most of its Balkan hinterlands to these barbarians. A Byzantium which still controlled North Africa, much of Italy, southern Spain, Egypt, Anatolia, and the Levant, had been reduced to strongpoints all around the Balkan littoral. During the wars with the Sassanids, the Avars took advantage of the opportunity offered, and even raided the suburbs of Constantinople itself! After 568 AD the nomadic Avars settled in the Carpathian Basin and founded their empire, which was an important force in Central Europe until the beginning of the 9th century AD. 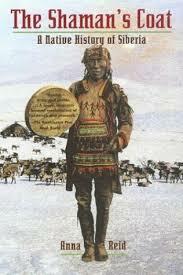 The Avar elite was probably of Inner Asian origin; its identification with the Rourans (who ruled the region of today’s Mongolia and North China in the 4th-6th centuries AD) is widely accepted in the historical research. Here, we study the whole mitochondrial genomes of twenty-three 7th century and two 8th century AD individuals from a well-characterised Avar elite group of burials excavated in Hungary. Most of them were buried with high value prestige artefacts and their skulls showed Mongoloid morphological traits. The majority (64%) of the studied samples’ mitochondrial DNA variability belongs to Asian haplogroups (C, D, F, M, R, Y and Z). This Avar elite group shows affinities to several ancient and modern Inner Asian populations. The genetic results verify the historical thesis on the Inner Asian origin of the Avar elite, as not only a military retinue consisting of armed men, but an endogamous group of families migrated. This correlates well with records on historical nomadic societies where maternal lineages were as important as paternal descent. The samples were from a period about a century after the arrival of the Avars. It is not unreasonable to think that the Avar conquest meant that a continuous stream of Inner Asian pastoralists kept entering into the territory which they occupied for the opportunity, but this sort of genetic distinctiveness indicates that the Avars remained very separate from the people from whom they extracted tribute. Most, though not all, of these people, were or became Slavs. Around 800 AD the Avars were finally defeated decisively by the Franks, and their elite converted to Christianity. I suspect this was the final step which would result in their assimilation over the next few centuries into the location population until they diminished and disappeared. The results above support the proposition that the Pannonian Avars of the second half of the 6th century were the descendants of the Rouran Khaganate of the early half 6th century. The kicker is that the Rouran flourished in Mongolia! So like the Mongols six hundred years later, the Avars seem to have swept across the entire length of Eurasia that was accessible to their horses in a generation. To some extent, this is a recapitulation of the pattern we see nearly 3,000 years before the Avar, when the Afanasievo culture established itself in the Altai region, far from its clear point of origin in the forest-steppe of Eastern Europe. 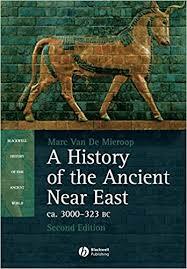 Perhaps the period between 500 BC and 300 AD can be seen as an ephemeral transient between the vast periods before and after when pastoralists had free reign across most of temperate Eurasia? The average European ancestry I got in my South African white samples, N = 12, is 93.5%. Making a composition individual, note that if someone had great-great-grandparents who were not European, they would be expected to have 6.25% non-European ancestry. That’s 4 generations back. So about 100 years. These individuals are presumably adults. Let’s say they are 25 years old. That goes back 125 years. It’s probably reasonable in a single person admixture people to suggest it was sometime in the mid to late 19th century. 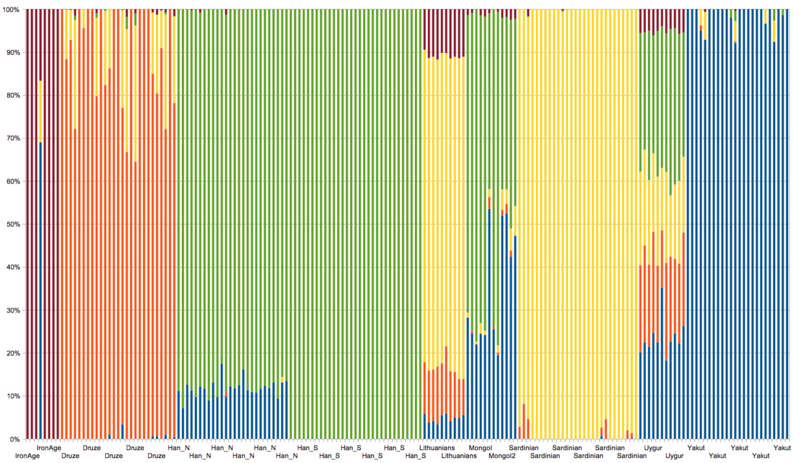 I will probably some ancestry deconvolution and see if I can get a figure for the time of admixture (though the fractions here are very small, as is the sample size of the admixtured population). But the non-European ancestry of Afrikaners is uncannily similar to the non-European ancestry of the Cape Coloureds. That to me leads us to the conclusion that in the early European settler community a fair number of mixed-race women married in. 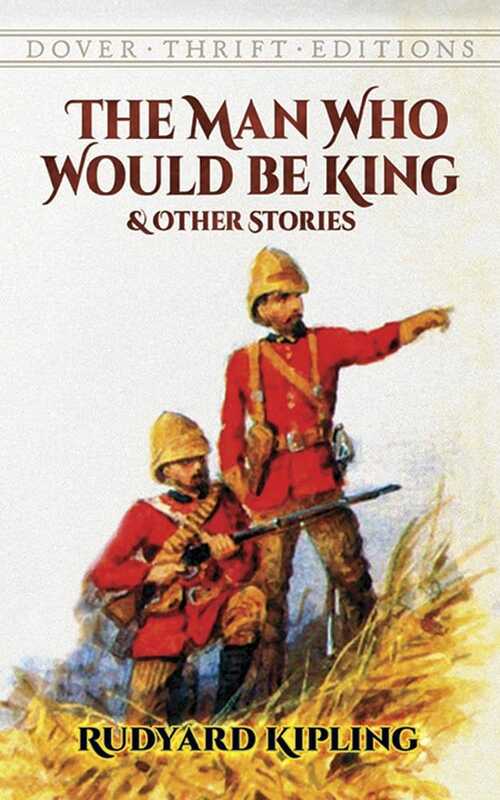 Those mixed-race women who married mixed-race men helped found the Cape Coloureds. In The population genomics of archaeological transition in west Iberia the authors note that “the population of Euskera speakers shows one of the maximal frequencies (87.1%) for the Y-chromosome variant, R1b-M269…” In the early 2000s the high frequency of R1b-M269 among the Basques, a non-Indo-European linguistic isolate, was taken to be suggestive of the possibility that R1b-M269 reflected ancestry from European hunter-gatherers present when farmers and pastoralists pushed into the continent. The paper above shows that the reality is that the Basque people have higher fractions of Neolithic farmer ancestry than any other Iberian people. Additionally, they have lower fractions of the steppe pastoralist ancestry than other Iberian groups. This, despite the fact that we also know from ancient DNA that R1b-M269 does seem to have spread with steppe pastoralists, likely Indo-Europeans. Obviously the relationship between Y chromosomes and genome-wide ancestry is complex. The pattern here for the indicates that Indo-European male lineages were assimilated into the Basques. Perhaps the Basque were matrilineal? One can’t know. But, these men did not impose their culture. Instead, they were assimilated into the Basque. This is entirely not shocking. There history of contact between different peoples in the recent past shows plenty of cases where individuals have “gone native.” In some cases, many individuals. I was thinking this when looking at South Asian Y chromosome frequencies. Though R1a1a is correlated with higher castes and Indo-European speakers, its frequency is quite high in some ASI-enriched groups. 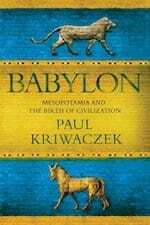 I suspect that the period after 2000 BC down to the Common Era witness a dynamic where particular patrilineal societies were quite successful in maintain their status over generations. Additionally, the ethnogenesis of “Indo-Aryan” and “Dravidian” India was occurring over this period, in some cases through a process of expansion, integration, and conflict. It seems some pre-Aryan paternal lineages were assimilated into Brahmin communities. For example, Y haplogroup R2, whose origin is almost certainly in the Indus Valley Civilization society. 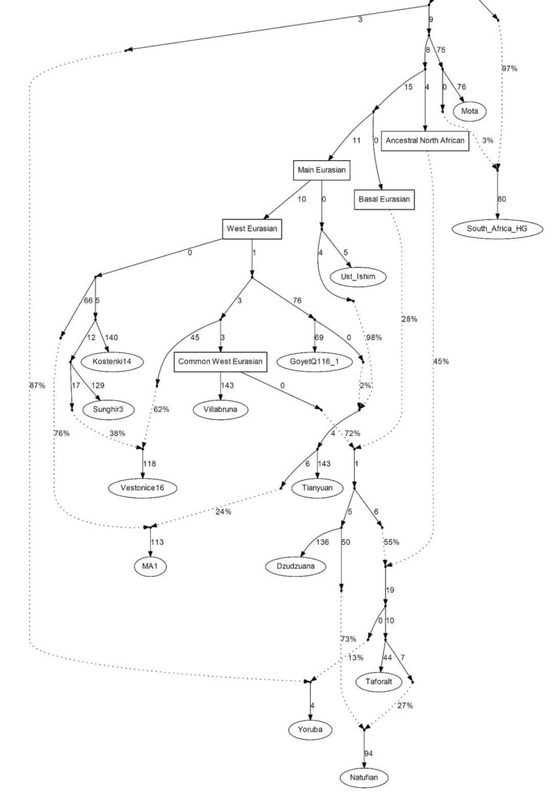 Some population genetic models are stylized and elegant. They have to be to be tractable. But we always need to remember that real history and prehistory were complex, and exhibited a richer and more chaotic texture. 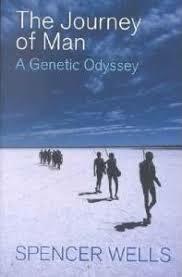 Last week Spencer and I talked about chromosomes and their sociological import on The Insight. It was a pretty popular episode, but then again, my post on the genetics of Genghis Khan is literally my most popular piece of writing of all time which wasn’t distributed in a non-blog channel (hundreds of thousands of people have read it). Thanks to everyone who left a review on iTunes and Stitcher (well, a good review). We’re getting close to my goal of 100 reviews on iTunes and 10 on Stitcher so that I won’t pester you about it. Of course the reality is that the heyday of chromosomal population genetic studies was arguably about 15 years ago, when Spencer wrote The Journey of Man. 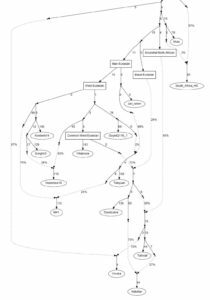 I have personally constructed Y phylogenies before…but as you know from reading this weblog, I tend to look at genome-wide autosomal studies. There is a reason that why Who We Are and How We Got Here focuses on autosomal data. All that being said, Y (and mtDNA) still have an important role to play in understanding the past: sociological dynamics. The podcast was mostly focused on star phylogenies, whether it be the Genghis Khan haplotype, or the dominant lineages of R1a and R1b. Strong reproductive skew does have genome-wide effects, but unless it’s polygyny as extreme as an elephant seal’s those effects are going to be more subtle than what you see in the Y and mtDNA. Submitted for your approval, two recent preprints on bioRxiv: The role of matrilineality in shaping patterns of Y chromosome and mtDNA sequence variation in southwestern Angola and Cultural Innovations influence patterns of genetic diversity in Northwestern Amazonia. The future is going to be in understanding sexual dynamics and culture. The figure to the left is from The genetic prehistory of the Greater Caucasus. If you are a regular reader of this weblog, or Eurogenes, you can figure out what’s going on, and keep track of the terminology. But in 2018 I think we’re getting to the end of the line in making sense of “admixture graphs” in relation to West Eurasian population structure. The models are just getting too complicated to keep everything straight, and the distinct-populations-subject-to-pulse-admixture seems to be an assumption that may not necessarily hold. To get a sense of what I’m talking about, the above preprint focuses on populations in and around the Caucasus region. One of the major reasons that this is important is that the Caucasus was and is to some extent a continental hinge, connecting Eastern Europe and the Pontic steppe, to the Near East. The Arab Muslims pushed north of the Caucasus, and came into conflict with the Khazars, while Cimmerians and Scythians moved south from the Pontic steppe. The elephant in the room is the relevance to the “Indo-European controversy.” Colin Renfrew long ago posited that the Indo-European languages derive from West Asian farmers who expanded into Europe as early as ~9,000 years ago. 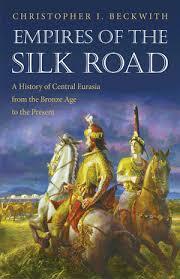 A rival theory is that Indo-Europeans spread out of the Pontic steppe ~4,000 years ago. In 2015 two major papers suggested that the steppe was a major source of Indo-European expansion. Case closed? This preprint suggests perhaps not. But we’ll get to that later. What do the results here show? The prose is a little hard to tease apart, but the major issues seem to be that in antiquity, or at least the period they’re focusing on, much of the gene flow seems to have been south (Near East) to the north (through the Caucasus, and out to the north slope). To some extent, we already knew this: the Yamna people of the Pontic steppe have “southern” ancestry from the Near East that earlier East European/Pontic people do not. 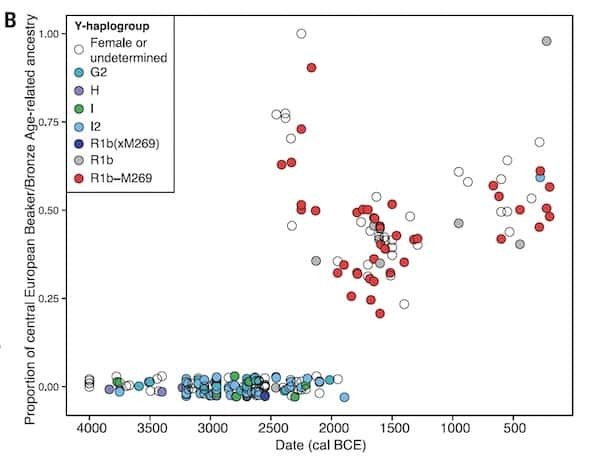 In this preprint, the authors show that groups such as the Maykop of the north slope of the Caucasus carry Y haplogroups such as G2, and not the R1 lineages commonly found in the steppe. David W. suggests that this confirms that Near Eastern gene flow into the steppe was female-mediated. This is plausible, but I would caution that Y chromosomes alone can be deceptive, due to the power of particular patrilineages. We’ll probably rely on the X chromosome to make a final judgment. A major aspect of this preprint is that it has to work hard to differentiate two Anatolian farmer-like signals: the first, from Anatolian farmers proper, and the second from the descendants of European farmers, who themselves are a mix of Anatolian farmers with a minority ancestry among the hunter-gatherers. The answers would probably be totally unintelligible if not for archaeology. It’s clear that the steppe people had contact with both European and Near Eastern farmers and that later East European groups that succeeded the Yamna were subject to reflux from Central Europe, and received European farmer ancestry. 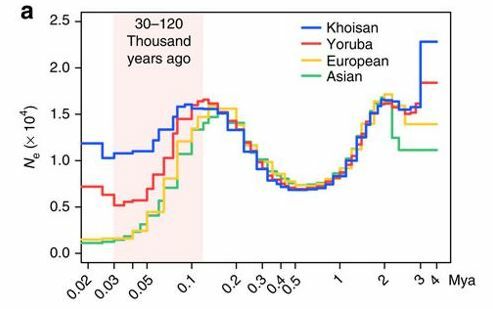 Another curious nugget in their results is that there was early detection of both Ancestral North Eurasian (ANE) ancestry and, some East Eurasian gene flow (related to Han Chinese). One of their individuals carries the East Eurasian variant of EDAR, which today is only found in Finns, though it was found in reasonable frequencies among the Motala hunter-gatherers of Scandinavia. Additionally, Fu et al. 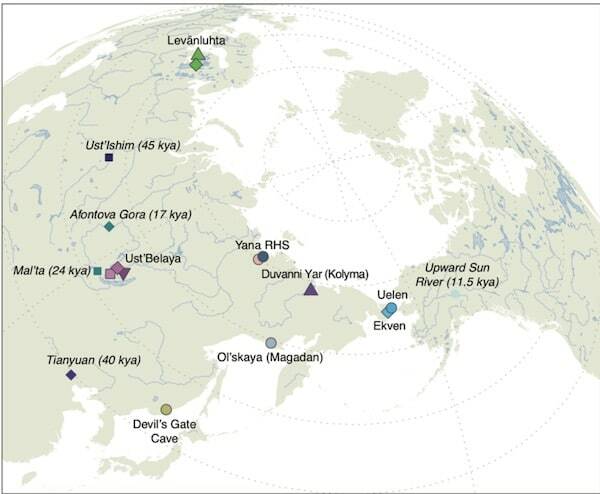 2016 found that the ancestors of Mesolithic hunter-gatherers received some gene flow from Eastern Eurasians as well (also in the supplements of Lazaridis et al. 2016). The authors admit that there is probably population structure among ANE and undiscovered groups of East Eurasians who were traversing the Inner Asian landscape. I think this is all suggestive of some long-distance contacts, though the intensity and magnitude increased a lot with high-density societies and the mobility of pastoralism. Much of the genetic mixing in the Near East, and to some extent in the trans-Caucasian region, seems to date to the 4th millennium. This is technically prehistory, but it is also the Uruk period. This was a phase of Mesopotamian culture expansion between 4000 and 3100 BC which resulted in replicas of Uruk style settlements as far away as Syria and southeastern Anatolia. There is even evidence of Uruk-related migration to the North Caucasus. The Uruk experienced abrupt and sudden collapse. Uruk settlements outside of the core zone of Mesopatamia disappear. The insight that the Caucasus mountains served not only as a corridor for the spread of CHG/Neolithic Iranian ancestry but also for later gene-flow from the south also has a bearing on the postulated homelands of Proto-Indo-European (PIE) languages and documented gene-flows that could have carried a consecutive spread of both across West Eurasia…Perceiving the Caucasus as an occasional bridge rather than a strict border during the Eneolithic and Bronze Age opens up the possibility of a homeland of PIE south of the Caucasus, which itself provides a parsimonious explanation for an early branching off of Anatolian languages. Geographically this would also work for Armenian and Greek, for which genetic data also supports an eastern influence from Anatolia or the southern Caucasus. A potential offshoot of the Indo-Iranian branch to the east is possible, but the latest ancient DNA results from South Asia also lend weight to an LMBA spread via the steppe belt…The spread of some or all of the proto-Indo-European branches would have been possible via the North Caucasus and Pontic region and from there, along with pastoralist expansions, to the heart of Europe. This scenario finds support from the well attested and now widely documented ‘steppe ancestry’ in European populations, the postulate of increasingly patrilinear societies in the wake of these expansions (exemplified by R1a/R1b), as attested in the latest study on the Bell Beaker phenomenon…. More interesting are the results in West Asia, and the linguistic supplement. In the authors note that tablets now indicate an Indo-Aryan presence in Syria ~1750 BC. Second, Assyrian merchants record Indo-European Hittite, or Nesili (the people of Nesa), as early as ~2500 BC. The apparent lack of steppe ancestry in five Hittite-era, perhaps Indo-European-speaking, Anatolians was interpreted in Damagaard et al. 2018 as a major discovery with profound implications for the origin of the Anatolian branch of Indo-European languages. But I disagree with this assessment, simply because none of these Hittite-era individuals are from royal Hittite, or Nes, burials. Hence, there’s a very good chance that they were Hattians, who were not of Indo-European origin, even if they spoke the Indo-European Hittite language because it was imposed on them. The main aspect I’d bring up with this is that in other areas steppe ancestry has spread deeply and widely into the population, including non-Indo-European ones. It is certainly possible that the sample is not needed enough to pick up the genuinely Hittite elite, but I probably lean to the likelihood that the steppe signal won’t be found. It seems that the Anatolian languages were already diversified by ~2000 BC, and perhaps earlier. Linguists have long suggested that they are the outgroup to other Indo-European languages, though this could just be a function of their isolation among highly settled and socially complex populations. Two alternative models present themselves for these results. The Anatolian Indo-European languages expanded through elite diffusion, part of the same general migrations that emerged out of the Yamna culture ~3000 BC. The lack of a steppe signal may be due to sampling bias, as David W. suggested, or, more likely in my opinion, simple dilution of the signal. Second, the steppe migrations were one part of a broader palette of population movements and cultural diffusions, and the Anatolian Indo-Europeans are basal to the efflorescence of the steppe derived branches. The evidence of the explosion of Indo-Aryans in the years after 2000 BC in West and South Asia, as well as the expansion of Iranians across vast swaths of Inner Asia during the same period, suggest to me that Indo-Iranians are most definitely part of the steppe pulse. 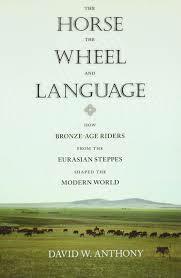 The connection to the Sintashta charioteers presents itself, and, connections to the Uralic languages indicates incubation in the trans-Volga region. We next tested a model of the present-day Lebanese as a mixture of Sidon_BA and any other ancient Eurasian population using qpAdm. We found that the Lebanese can be best modeled as Sidon_BA 93% ± 1.6% and a Steppe Bronze Age population 7% ± 1.6% (Figure 3C; Table S6). 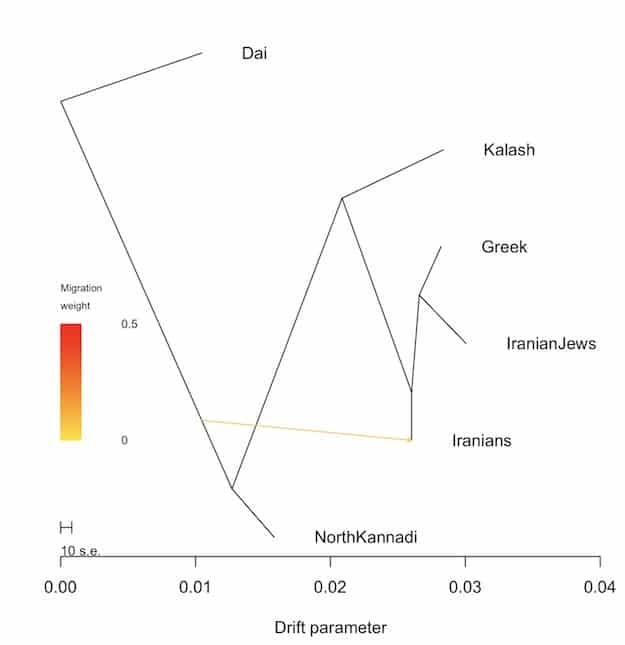 To estimate the time when the Steppe ancestry penetrated the Levant, we used, as above, LD-based inference and set the Lebanese as admixed test population with Natufians, Levant_N, Sidon_BA, Steppe_EMBA, and Steppe_MLBA as reference populations. We found support (p = 0.00017) for a mixture between Sidon_BA and Steppe_EMBA which has occurred around 2,950 ± 790 ya (Figure S13B). This needs to be more explored. The admixture could have come from many sources. I am curious about the frequency of R1a1a-z93 among modern-day Syrians and Lebanese. For me these arguments can only be resolved with a deeper understanding of linguistic evolution. The close relationship of Indo-Aryan and Iranian languages is obvious to any speaker of either of these languages (I can speak some Bengali). A divergence in the range of 4 to 5 thousand years before the present seems most likely to me. But the relationship of the other Indo-European languages is much less clear. One of the arguments in Peter Bellwood’s First Farmers is that the Indo-European languages exhibit a “rake-like” topology with the exception of Indo-Iranian, which forms a clear clade. To him and others in his camp, this argues for deep divergences very early in time. It is hard to deny that the steppe migrations between 4 and 5 thousand years ago had something to do with the distribution of modern Indo-European languages. 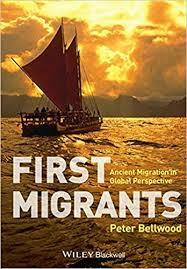 But, it is harder to falsify the model that there were earlier Indo-European migrations, perhaps out of the Near East, that preceded these. Only a deeper understanding of linguistic evolution, and multidisciplinary analysis of regional substrates will generate the clarity we need. * I’m going to skip the Botai angle in this post. Comments Off on Is American genetic diversity enough? Are Turks Armenians under the hood? 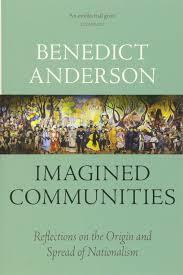 Benedict Anderson’s Imagined Communities: Reflections on the Origin and Spread of Nationalism is one of those books I haven’t read, but should. 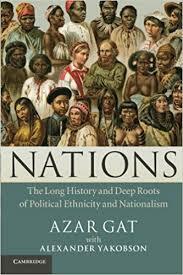 In contrast, I have read Azar Gat’s Nations, which is a book-length counterpoint to Imagined Communities. To take a stylized and extreme caricature, Imagined Communities posits nations to be recent social and historical constructions, while Nations sees them as primordial, and at least originally founded on on ties of kinships and blood. The above doesn’t capture the subtlety of Gat’s book, and I’m pretty sure it doesn’t capture that of Anderson’s either. But, those are the caricatures that people take away and project in public, especially Anderson’s (since Gat’s is not as famous). When it comes to “imagined communities” I recently have been thinking how much that of modern Turks fits into the framework well. Though forms of pan-Turkic nationalism can be found as earlier as 9th-century Baghdad, the ideology truly emerges in force in the late 19th century, concomitantly with the development of a Turkish identity in Anatolia which is distinct from the Ottoman one. The curious thing is that though Turkic and Turkish identity is fundamentally one of language and secondarily of religion (the vast majority of Turkic peoples are Muslim, and there are periods, such as the 17th century when the vast majority of Muslims lived in polities ruled by people of Turkic origin*), there are some attempts to engage in biologism. This despite the fact that the physical dissimilarity of Turks from Turkey and groups like the Kirghiz and Yakut is manifestly clear. Sometimes the Turkish fascination with the biological comes out in strange ways, Turkish genealogy database fascinates, frightens Turks. Much of the discussion has to do with prejudice against Armenians and Jews. But the reality is that most Turks at some level do understand that they are descended from Greeks, Armenians, Georgians, etc. To interrogate this further I decided to look at a data set of Greeks, Turks, Armenians, Georgians, and a few other groups, including Yakuts, who are the most northeastern of Turkic peoples. 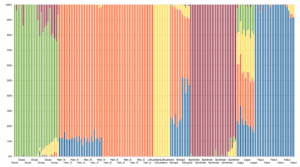 The SNP panel was >200,000, and I did some outlier pruning. Additionally, I didn’t have provenance on a lot of the Greeks, except some labeled as from Thessaly. I therefore just split those up with “1” being closest to the Thessaly sample and “3” the farthest. First, let’s look at the PCA. The Turks are shifted toward the Yakuts, but not too much. In contrast, there is much more of Yakut shift in Tajiks, and especially Turkmens. These are two groups from further east, closer to the heart of the zone Turkic expansion. Curiously, the Tajiks, who are the dominant non-Turkic Iranian speaking people of Central Asia, actually have more East Asian ancestry than the Turks of Turkey. This goes to show that ethnicity is somewhat fluid, and Turkic people have assimilated into the Tajik identity. That being said, please note that the Turkmen are notably more east-shifted than the Tajik. Let’s see how this looks on pairwise Fst. 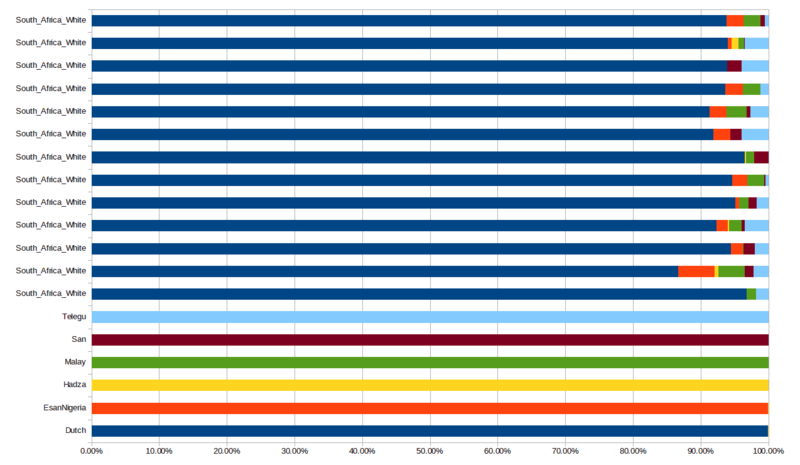 On this, you can see that the relationship of the Greece clusters on Treemix to Lithuanians matches PCA. Greece1 is the closest, Greece 3 the farthest. The Turks are close to the Georgians and Armenians, but not the Kurds, or Tajiks. And, they receive gene flow from the Turkmen-Yakut region of the graph. So do the Tajiks…but the Tajiks also remove gene flow from the Lithuanians. 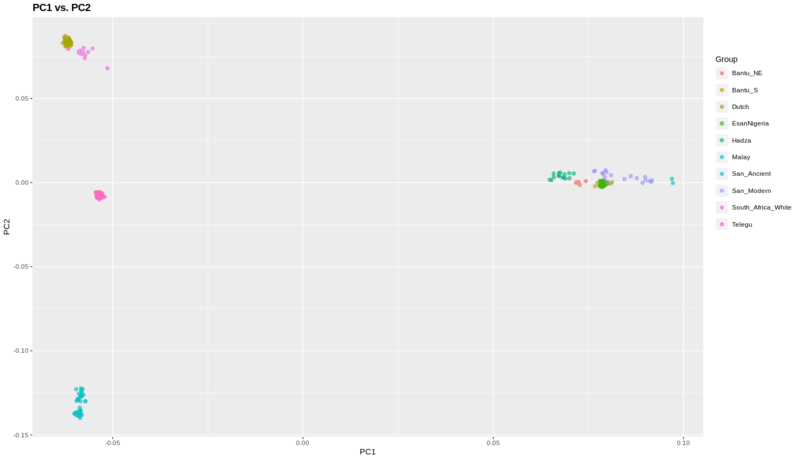 The admixture plot makes it more clear what’s happening I think. Yellow ~ modal in Southern Europe, green ~ modal Northern Europe, red ~ Central Asian, while blue and purple are northern and southern East Asian. In comparison to Turks of Anatolia Tajiks have a lot more Northern European affinity, probably because of the common steppe heritage. Not surprisingly, Turks have more Southern European like ancestry. Curiously the East Asian ancestry in the Turkic people seems to be both Yakut and Dai like, so perhaps it was more cosmopolitan than we might think? The Yakuts after all are from the northern edge of the range, and may have absorbed a lot of indigenous Siberian ancestry. Georgians have none of the Northern European sort of ancestry, but Armenians do, and Turks even more. One could posit that this is due to Slavic ancestry arriving with the Rumelian Turks who arrived in the 20th century, but just as likely is the possibility that Turks have a lot of ancestry from western Anatolia which was Greek, and Greeks have more of this than Armenians. 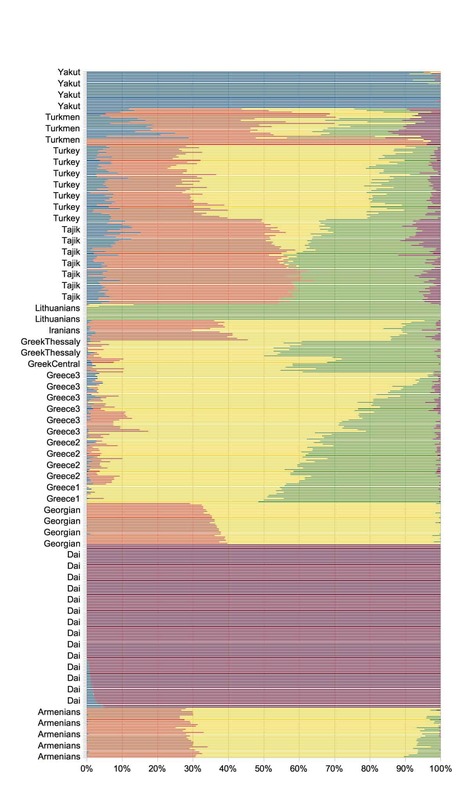 It’s hard to tell from these results whether Turks have more of an affinity with Greek or Armenians as their non-Turkic ancestors. So I ran a three population test. Armenians beat out Greece3 a bit better, but really it’s hard to say from this that this is definitive. It’s likely that my Turkish sample has both, and/or the original Turkic nomads had Iranian-like ancestry which was more like Armenian than Greek? Hard to say. Additionally, the face that Greece3 is better than the other options suggests to me that the source are Anatolian Greeks who were less impacted by migrations from the north than Greeks in Greece proper. * The Mughals were Central Asian Turks, while the Safavids were mostly Azeri Turks. ** Since the Turks who arrived in Anatolia had long sojourned in Turn and Iran it is important not to assume that their contribution is limited only to the East Asian component of ancestry. Comments Off on Are Turks Armenians under the hood? It’s been a big week for “Cheddar Man” and the science around him. I already talked about the issue blog-wise for my day job. Additionally, Spencer and I did a podcast on the topic (if you haven’t, please subscribe and leave positive reviews and ratings on iTunes and Stitcher; next we’ll post our conversation with Chris Stringer, don’t miss it!). Much of the media is focused on the predicted pigmentation of Cheddar Man. That is, dark. Back when the La Brana Western Hunter-Gatherer results came in with the same finding, several population genomics people pointed out that it might not be valid to predict their phenotype based on modern training sets. Cheddar Man and the WHG in general were probably darker than modern Northern Europeans. There is detectable selection in modern Europeans for pigmentation alleles down to the present, and Northern Europeans are the palest people in the world. And, pigmentation is polygenic, but it’s not hyperpolygenic. That’s why GWAS and early selection tests picked up pigmentation loci as hits so often. Cheddar Man and the WHG in general were probably not as dark as tropical people. The only people who live(d) at very high latitudes who were very darkly complected were Tasmanian Aboriginals and Australian Aboriginals (Melbourne is at the same latitude south as Lisbon is north). In contrast, we see that Khoisan are brown, sometimes rather lightly so, while the peoples of non-European heritage who live in high latitudes are not dark-skinned, though they are not as light-skinned as Europeans. We don’t have a time machine, so we won’t know with finality. But, it seems that pigmentation pathways are finite, and eventually we can probably be more confident if Cheddar Man had a genetic architecture that would lead to fewer and smaller melanocytes. The preprint that came out with the Cheddar Man documentary really focused mostly on the Neolithic farmers. The data set was large, and it emphasized that the discontinuity between the farmers, who were EEF from Anatolian stock (modern Sardinians are their best proxies), the hunter-gatherers. WHG is genetically homogeneous, so they couldn’t reject the proposition that there was no admixture of British hunter-gatherers into the farmer population Basically, the thesis that Peter Bellwood outlined in First Farmers is well supported by these results. 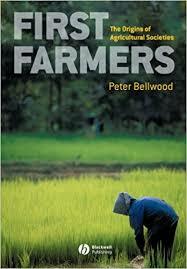 The farmers brought agricullture, and pushed aside or absorbed the hunter-gatherers. It is notable to me that they found more hunter-gatherer ancestry (possibly) in eastern and northern populations, but not much in farmers from Wales. Additionally, though they couldn’t be definitive about it, the EEF settlers of Britain seem to have more affinities with the Western Mediterranean populations than the Central European ones. This suggests that perhaps the farmers arrived by sea or coast-hugging from the south and west, rather than from the south and east. Farmers came to Britain later than to the continent. The shift from hunter-gatherer to farming was rapid. One model for why there was lack of admixture is that the farming cultural package was fully adapted to Northern Europe by the time they began settling the island. In contrast, on the mainland farmers were changing a Middle Eastern lifestyle into something that could take root in cold northern climes where there were already local residents. Today Europe, and much of Western Eurasia, is characterized by isolation by distance dynamics between populations. What you see in the transition from the Mesolithic to the Neolithic, and later with the arrival of metal age populations (Bell Beakers), is that populations can turnover fast, and that rapid expansion and growth can result in homogeneity across huge distances and then sharp continuities across cultural divides. The classical example of this is that hunter-gatherers and farmers in Central Europe did not exchange much in the way of genes for centuries, and their between population variance accounted for ~10% of their pooled variance (this is what you see comparing Han and Europeans). Additionally, WHG and EEF are both relatively homogeneous, at least before the latter began to absorb WHG at different fractions across its range. WHG descends from a late Pleistocene expansion, after the Last Glacial Maximum. Similarly, the EEF expanded rapidly from its Anatolian point of origin. Ten years ago many people thought at Cheddar Man and his people were the ancestors of most of the people who lived in Britain today. At the same time as this preprint came out, the Bell Beaker paper was officially published. We now know that Britain went through two massive demographic transitions in less than 2,000 years, with on the order of a 90% replacement in a few centuries both times. Why? Was this typical? Those are for a later post…. Every few years I get asked about Nuristanis and Kalash. The reason is that these people are often white. By white, I mean that some Nuristanis and Kalash are fair-skinned, blonde-haired, and blue-eyed. Entering “Nuristani” into Google images returns some very white faces. And you have weird news stories about ‘white’ Taliban, because non-locals don’t realize that some Nuristanis look like Northern Europeans. Since the vast majority of people who look like white Northern Europeans are white Northern Europeans, many people assume that the Nuristanis and Kalash must have some kinship to white Northern Europeans. More precisely, many have spread the legend that these people have some relationship to the soldiers of Alexander the Great (even though Macedonians are Southern European…details). As it turns out, they do have some kinship to Europeans…but not inordinately more than any of the other peoples of the region. 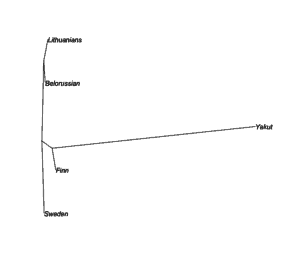 The TreeMix plot at the top of this post shows that Greeks are far closer to Iranian Jews than they are to Kalash. In fact, the Kalash clearly have a non-trivial proportion of “Ancestral South Indian” South Asian ancestry. Table S4 show highly significant evidence (p value < 10−10) in the Kalash when using Armenia and Chamar as surrogates. Eight other pairings of surrogates give p values < 10−5. In all cases, the surrogate pairs include one group from South Asia (Chamar, Kol) and the other from West Eurasia (Armenia, Adygei, Brahui, Hungarians, Palestinians, Tuscans), consistent with admixture from a West Eurasian source. Chamar are a Dalit caste of Northern India if you don’t know. So what’s going on with the Kalash and Nuristanis? Appreciable frequencies of alleles which are correlated with traits like blue-eyes are found amongst them. Though the frequencies are much lower than in Northern Europeans. Very white looking Nuristanis and Kalash may be highly salient to photographers and the Western media, but it turns out most Nuristanis and Kalash look West Asian, with a minority who are dark-skinned enough that their South Asian ancestry is also quite clear. This disjunction between appearance and ancestry should not surprise us. 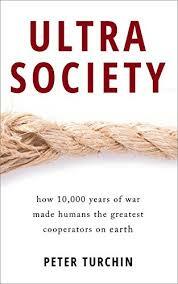 There has been a lot of recent change in physical appearance across populations over the last 10,000 years. Europeans themselves have changed in appearance. Similarly, other populations have as well. Some of them look similar to Europeans due to happenstance or convergence. Another case are the Ainu of Japan. Though as an unadmixed group they no longer exist, old photos show some of them exhibiting an appearance not typical of East Asians. This led early anthropologists to posit that the Ainu were a “lost white race.” And yet to my knowledge, no European ancestry is found in Hokkaido, or in the Tohoku region, where Ainu-like people lived down to the early medieval period. The moral of the story: don’t judge the contents of the book by its cover. A new preprint, Mitogenomic data indicate admixture components of Asian Hun and Srubnaya origin in the Hungarian Conquerors, throws a rather large sample of medieval mtDNA samples at the question of the ethnogenesis of the Magyar people. The context here is that Maygars speak a non-Indo-European language, with a distant relationship to the Finnic ones, but genetically are not much distinguished from their neighbors. But the differences are not non-zero, ‘best of breed’ methods can pick up a small fraction of exotic ancestry. The results above are based on samples from cemeteries of the Magyar elite. These are people who identified with a steppe confederacy which coalesced in the 9th century in the Volga region, and in 895 conquered the region of Central Europe which we now term Hungary. In the 10th century, the Magyar tribes were an alien and predatory force within Europe, pagan and exotic. They were, in fact, the latest in a long time of mobile Central Asian horsemen, going back to the Scythian, Sarmatians, Huns, and Avars. What the data from these results confirm is that a substantial proportion of the maternal lineages of the Hungarian nobility were East Eurasian. Their genetic profiles, in fact, resembled Scythians who had mixed with Altaic peoples, even if they were not descended from those people. What this suggests is that the Magyar conquest elite was part of a broader landscape of ethnolinguistically distinct, but interconnected, steppe confederations. The preprint gives great space to the likelihood that a substantial proportion of the Magyar elite was in fact Turkic in origin. This leads to one of the major assertions of the paper: the distinctive linguistic identity of modern Hungarians is a legacy of the Hunnic period, and not the Magyar conquest. From what I can tell they didn’t have older DNA, so I don’t know how they came to this conclusion, except that the conquest Magyars were small in number, and seem to have been decimated over time (Mongol invasion, the battle of Mohacs).